Alert Gazette readers will remember that I'm in the middle of a VIRP, namely digitizing a bunch of old vinyl record albums. I'm now going through my parents' collection, and I've turned up another couple of gems. But first, some context. I'm a long-time fan of Glenn Miller's music. In fact, one of the first music CDs I purchased was In The Digital Mood, which contained a dozen of Miller's original arrangements played by what was in effect a cover band (the musicians are listed on the preceding link). I remember playing it for my dad and pointing out that, while the music was certainly crystal clear, the most amazing thing was the absolute silence between the tracks. I also remember that while he said nothing in response, his expression communicated the fact that I was clearly daft and possibly switched at birth at the hospital. Anyway, I found a couple of Glenn Miller LPs in my parents' collection, and both of them featured original recordings by both Miller's orchestra and the Army Air Force (AAF) band he led during the latter part of World War II. One is a two-platter set with the unwieldy title of The Complete Glenn Miller - Vol III - 1939-1940; the other is The Authentic Sound of Glenn Miller - Yesterday. The first album, released in the mid-70s, featured songs that were originally issued by RCA Victor's budget label Bluebird Records. 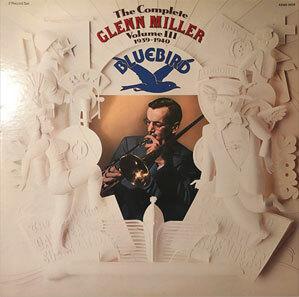 According to the liner notes on the second album (the entirety of which are included below), Miller actually requested that his music be published by Bluebird instead of the flagship RCA Victor in order to avoid the competition of the likes of Benny Goodman, Tommy Dorsey, and Artie Shaw. The Bluebird records primarily contain songs that I'm not familiar with, but there are arrangements of standards like When You Wish Upon A Star (the first Disney song to win an Academy Award), Stardust, and Melancholy Baby. On the other hand, The Authentic Sound album is pretty much a greatest hits collection, with the exception of Alice Blue Gown, a waltz that I'd never before heard. Miller was primarily known for his swing music, and waltzes were a rarity in his book, according to the album's liner notes. And speaking of liner notes -- they are real focus of this post. They were written by George T. Simon, a close friend of Miller, his drummer in the band's early days and then later as a member of the AAF Band, and eventually a long-time editor of Metronome, a music magazine that ended in 1961 after eighty years of publication. After reading up a bit about Mr. Simon, I suspect that if there was anything he didn't know about jazz and swing during the Glenn Miller era (and for decades afterward), it probably wasn't worth learning. Excuse the rambling...back to the subject at hand. 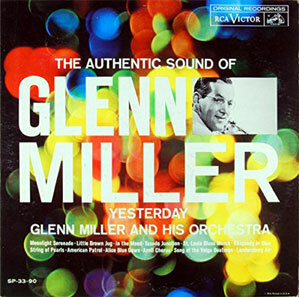 The Authentic Sound album is a pleasure to listen to, especially knowing that it represents performances by the actual musicians that comprised the Glenn Miller Orchestra and the Army Air Force Band. The skill of those musicians is evident even to a casual listener. If you can find a copy of the album, I recommend it...and not just for the music. Simon's liner notes, following a quick history of Miller's early recording career, provide a descriptive blurb for each of the dozen songs on the album. Simon assumes a certain amount of musical knowledge on the part of the reader, and throws in details that only someone who was on the ground with Miller could have known. Glenn Miller's arrangements and his bands' skill made their music incredibly accessible, but Simon's liner notes somehow even improve that accessibility. For that reason -- and to preserve the historic record -- I'm reproducing those notes in their totality below. You may think that's a geeky thing to do and I won't argue it's not, but if you're a Glenn Miller fan, I believe you'll appreciate Mr. Simon's contribution. By the way, even if you choose to skip most of the liner notes, at least jump to the bottom and read the one about Little Brown Jug, because I include a little surprise to go along with it. This is the way the Glenn Miller band used to sound in its heyday. 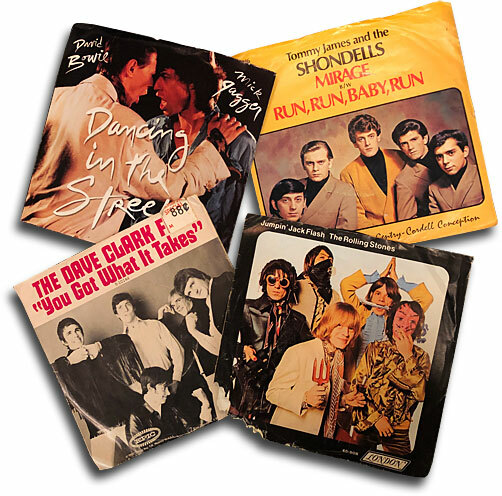 The tunes are a dozen of the most popular the band ever recorded and all these versions are the RCA Victor originals, most of which, of course, were first issued on the company's economy-priced Bluebird label. Seems Glenn wanted it that way when he first joined the company, because he figured he'd have less competition from Victor's already established star bands such as Tommy Dorsey, Benny Goodman and Artie Shaw, all close Miller friends, by the way. Toward the end, though, the Miller band became such a big attraction that everyone concerned considered it most ridiculous not to raise the band to the advanced-price label - ergo, Rhapsody in Blue and American Patrol appeared on Victor. You may not hear any stereo sounds, nor modern jazz choruses either, on these recordings, for they were made in the period from April 1939, when the band was playing its first engagement at Frank Dailey's Meadowbrook, to July 1942, shortly before Glenn volunteered and was accepted by the U. S. Army Air Force. But you will hear a meticulously disciplined crew that had an over-all sound and definiteness that few outfits approach these days. For Glenn was a disciplinarian who would even drill each section individually for hours at a time, if necessary, and then eventually blend each of them into a cohesive whole. It was a band whose musicians worked with a zeal and a pride and a sense of purpose that are rather rare on today's scene. All of these sides have been previously reissued on RCA Victor long-playing records, but they have been programmed this way especially as interesting contrast to the new recordings of the same arrangements made by today's Glenn Miller band under the direction of Ray McKinley on a companion disc. American Patrol (April 2, 1942) was arranged by Jerry Gray and features another arranger, Billy May, on trumpet. The band had achieved an amazing precision by this time, quite apparent on this recording. Rhapsody in Blue (July 16, 1942) was the band's final commercial recording. Bobby Hackett, who also played guitar in the band, is featured on trumpet, while Tex Beneke blows the very relaxed, wistful tenor sax. In the Mood (July 1,1939) proved to be one of the band's really big hits. Originally this was a long work which composer Joe Garland had first given to Artie Shaw, but the latter couldn't cut it down to effective record-length size. This Glenn did. The two-bar tenor solos alternate between Beneke and Al Klink, a vastly under-rated saxist in those days, while Clyde Hurley plays a forceful trumpet solo. Alice Blue Gown (March 31. 1940) was one of the few waltzes in the band's book. The very legitimate, Freddy Martin-like tenor was played by Beneke. Song of the Volga Boatmen (January 17, 1941) got the following review in the March 1940 issue of Metronome : "The influence of Billy May becomes more apparent in the Miller band, record for record. It gets its best beat on Song of the Volga Boatmen an interesting arrangement on which the band really kicks. May plays some fine muted trumpet and Ernie Caceres gets off a helluva good alto passage. It'd be an interesting thing for somebody to explain exactly why this band's jazz started perking up when May joined it." I agree with the review. I should. I wrote it. The Anvil Chorus (December 13, 1940) is a telescoped version of parts one and two that comprised the original Bluebird record. Soloists In order: Beneke's tenor, Hurley's trumpet, Chummy MacGreggor's piano fill-ins Moe Purtill's drums and recently-arrived Caceres' clarinet passage that shows the influence of Pee Wee Russell with whom he had been playing. Moonlight Serenade (April 4, 1939) offers the perfect sample of the band's distinctive clarinet lead reed sound. It's beautifully played here, with a sectional blend that no Miller imitator has ever been able to match. St. Louis Blues March (July 1943) is played by the Miller AAF Band. This particular version was recorded in RCA Victor's studios especially for V Discs. [Ed. "V Discs" were special recordings made for the benefit of U.S. military personnel.] The big band made a special trip down from New Haven for this session and used a larger brass and reed section than the civilian band employed. Ray McKinley was the leader of the drum section. The alto sax solo is by Hank Freeman. Londonderry Air (February 5, 1940) was one of the band's early stage show features, with the reeds and brass sections set in dramatic pin spot lighting. Interesting sidelight: On the band's first stage show, the lighting man became confused and kept lighting the section that wasn't playing. Glenn still managed to get out his trombone solo, however. This number was originally recorded under the title of Danny Boy. String of Pearls (November 3, 1941) features an alto sax chorus by Caceres and then two-bar alto sax exchanges between Caceres and Beneke in that order, followed by another challenge on tenors between Klink and Babe Russin, who recorded with the band for one date only. (Procedural verification by Klink, himself.) Beneke was also playing lead alto, returning to tenor when Skip Martin joined the band shortly thereafter. The pretty trumpet is blown by Bobby Hackett. Tuxedo Junction (February 5, 1940) spots Hurley on the open jazz solo and Dale McMickle on the daintier, muted passage. There's a Moe Purtill drum solo in place of the bass passage heard on the McKinley version. Little Brown Jug (April 10 1939) was, despite anything you may have seen and heard in the movie of Miller's life, the band's first Jazz hit. Bill Finegan, of later Sauter-Finegan fame, wrote the arrangement which features solos by Beneke and Hurley and a swinging passage by Glenn himself. It's been almost eighteen months since we moved into our retirement home, and "we" still have about a dozen boxes in the garage that haven't been unpacked. And by "we" I mean MLB. The boxes contain items that were in her parents' possession and are difficult to dispose of, for understandable sentimental reasons. Many of those items date back to when she and her sister were very young. The term "antique" doesn't quite apply, but "vintage" certainly does. 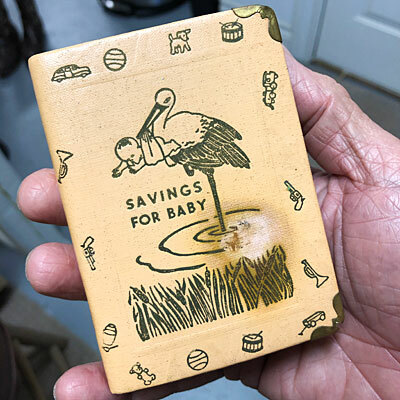 Decades before there was such a thing 529 college savings plans, this was apparently the way parents ensured that their children would be financially prepared. It's a piggy (storky?) bank shaped like a book. And this one had contents that made an intriguing jangling sound when shaken. It was also a very secure. 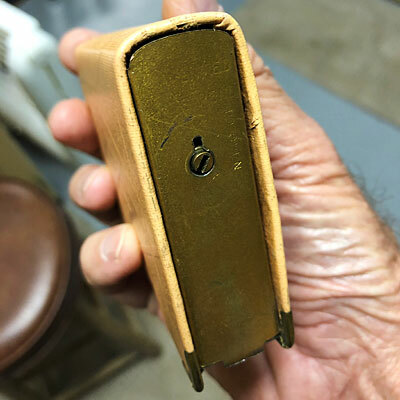 My trusty Dremel tool made short work of the locked door hinge (after acquiring MLB's permission, of course), and it was with great anticipation that I pried the little door open. What would we find? Real silver dollars? Truly antique coins? Gold doubloons? The key to Jimmy Hoffa's coffin? 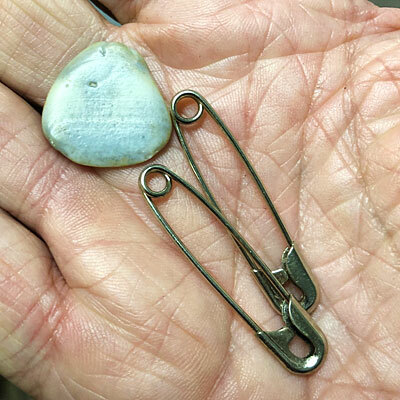 Unless that smooth stone is actually an uncut diamond and those safety pins were originally on Noah's ark, MLB's parents apparently weren't too serious about sending their kids to college. I'll admit to being a little disappointing. But on the upside, any day where you get to use a Dremel tool to break into something is a good day. How many Aggies does it take to change a light bulb? Two. One to climb the ladder and one to dial 9-1-1. OK, let's get something out of the way first. No one had to call 9-1-1, but rest assured that MLB had her dialing finger at the ready. 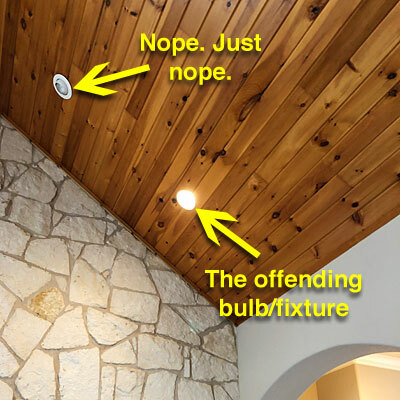 A bulb in one of the recessed lighting fixtures in our living room burned out over the weekend. No big deal, right? After all, it's only FOURTEEN FEET OFF THE FLOOR. Fortunately, I have one of those extendable light bulb unscrewer thingies and it easily reached and removed the floodlight. Well, it removed most of it. You may have encountered this situation before. You start unscrewing a light bulb, feel a light snap, and the glass portion of the bulb comes out while the base remains firmly attached to the fixture. This can occur for any number of logical reasons. The bulb may have been screwed in too tightly, or some slight oxidation over time caused it to bond with the fixture, or the universe despises you and seeks every opportunity to demonstrate it. Rather than attempt to extricate the frozen base immediately, I chose to take a couple of days to strategize. I did mention FOURTEEN FEET, right? Of all the phobias I don't have, acrophobia isn't one of them. I needed time to decide whether living in the dark was really such a bad option. A couple of days later, I resigned myself to doing what needed to be done, and that didn't include selling the house and buying one with newer light bulbs and lower ceilings. I was fully prepared to bring in the extension ladder and clamber up there to remove the stuck bulb base and put in a new bulb. But first...why not use the aforementioned light bulb unscrewer thingie's rubberized broken bulb socket remover attachment (it's genius, really; genius!). Granted, it hardly ever works, but when it does, it's magic. So I attached it to the pole -- it vaguely resembles an invasive medical apparatus -- and inserted it in the light fixture. Miraculously, the stuck base began to loosen until it was finally freed and ... came loose and laid trapped inside the fixture. So, naturally, I began to attempt to fish the bulb base loose with the pole, because I couldn't install a new bulb until it was removed. I eventually succeeded in knocking it out of the fixture, where it fell to the floor, sending tiny shards of glass everywhere. As I knocked the loose base of the bulb from the ceiling, the trim ring came down with it, exposing an ugly hole. I might as well have aimed a 12-gauge shotgun at the bulb and fixture. After all of that effort, I was still going to have to get on the ladder to see if and how I could repair the fixture. I've replaced a recessed fixture baffle before and it's not a huge deal, unless you're FOURTEEN FEET OFF THE FLOOR. Also, I'd have to make the twenty mile round trip to Home Depot to get another baffle. I put the ladder in place and asked MLB to brace it. I slowly and sweatily crept up the ladder and managed to unhook the baffle and remove it. As I inspected it, a happy realization began to dawn on my nervous mind: the trim ring had not broken off the baffle. It simply slipped over the top of the baffle, meaning that I wouldn't have to install a new one after all. Perhaps the universe didn't hate me after all; perhaps I was just unlikeable. 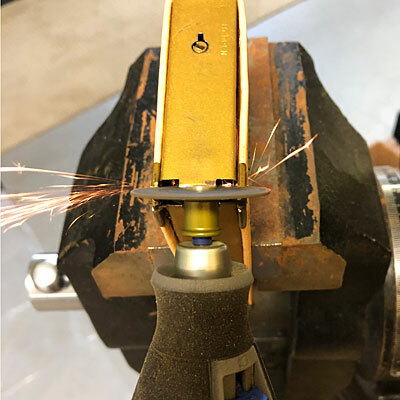 Installing a baffle is a (theoretically simple) matter of attaching two spring-loaded hooks into microscopically small slits in the side of the fixture, using only harsh vocabulary as a tool, and without the benefit of sight and while FOURTEEN FEET IN THE AIR. But I eventually succeeded, and the installation of a new bulb was an inconsequential afterthought. I would feel much better about all of this if I didn't know that there are six other similarly-situated bulbs of the same approximate vintage, shining down malevolently at me. Oh, and did I mention that two of them are SEVENTEEN FEET OFF THE FLOOR?! One of my VIRPs (Very Important Retirement Projects) is digitizing my vinyl LPs. I don't have room in our media cabinet for a turntable and there's no point in storing albums that will never be listened to in their original format, so I'm converting them to AIFF files and importing them to iTunes. They still may not get listened to -- I made some questionable musical decisions back in the 60s, 70s, and 80s -- but at least they'll be accessible. I've almost finished ripping my collection of about 150 records (I didn't deem all of them worth keeping, and some I had already downloaded in digital format, so the actual number is much less), and I've turned my attention to some albums that my parents owned. My dad had a fairly extensive collection of classical music. I'm not sure why, as I don't recall that he listened to them very much. It could be that he joined one of those "record of the month" clubs and it took a while to get out of it. I confess that other than some Beethoven symphonies and some Mozart emo synthopop (I kid, I kid...but, who knows? maybe for his time, that's what it was), I'm not keeping any of them. Dvořák's music is boring to me, plus I hate having to copy his name from a Google search in order to get all the weird characters right. My parents' record collection also included many old gospel albums, including Gospel Music's Top Ten for 1971 and an undated live concert recording by Cynthia Clawson at the First Baptist Church of Conroe, Texas (in which she managed to "Christianize" Paul McCartney's Let It Be). I'll digitize some of these albums and put them in my mom's iTunes collection next time I'm home. They had a lot of other recordings which I'll charitably refer to as "unique," including one I really want to spotlight here. It's a special release ("PREMIUM RECORD PROMOTIONAL COPY ONLY!") by the Columbia Special Products division of Columbia Records, and it's entitled Famous Football Songs of the Southwest Conference. You remember the Southwest Conference, right? It existed for 82 years, until 1996 when it morphed into the Big 12 Conference and out of the national span of attention. Insert favorite "SEC SEC SEC" chant here. Thirteen different universities were members of the SWC at one time or another, although most of us who remember the conference remember the eight "core members": the universities of Arkansas, Baylor, Rice, Southern Methodist, Texas, Texas A&M, Texas Christian, and Texas Tech. 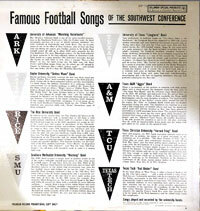 The aforementioned record contains the school songs and the fight songs of each of the core eight, as played by each university band. Each band is given a paragraph of glowing praise on the album jacket (feel free to click on the small images above to see embiggened versions that you may or may not be able to read). If you're an alumnus of any of these institutions, you may find the descriptions interesting, either from what they do or don't mention (e.g. the Rice University Band is not described as the MOB, which stands for both "Marching Owl Band" and their gameday behavior on and off the field...or so I've been told), or for the dated information (e.g. 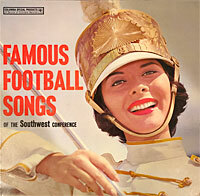 the Fightin' Texas Aggie Band -- an outfit with which I have some personal familiarity -- now has more than 300 members). 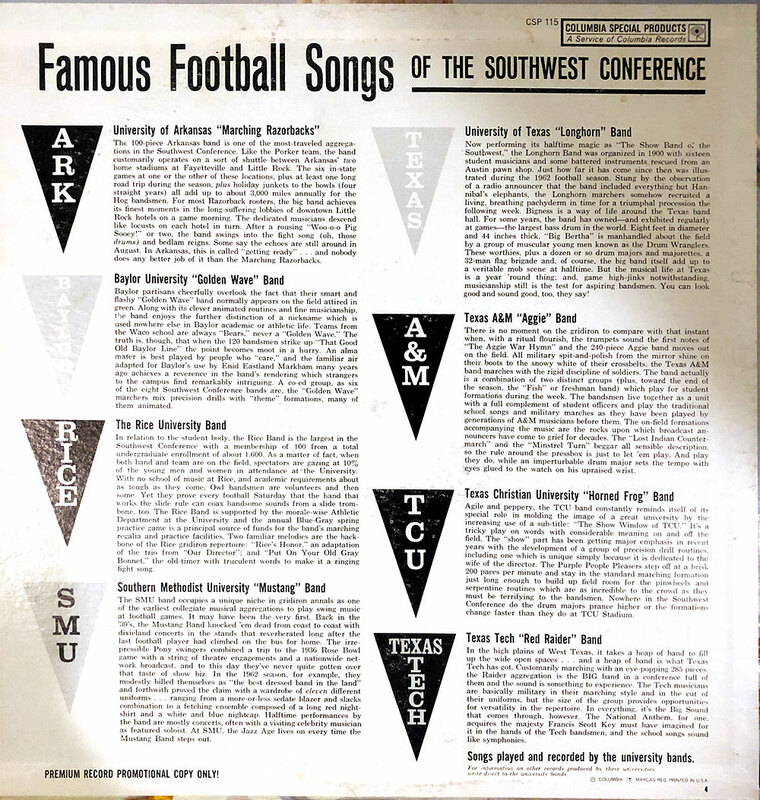 The record is undated, but it must have been issued prior to 1972, because the University of Houston is not represented and that's the year it joined the SWC. One last interesting tidbit. The record label carries this mention: "Specially prepared for Humble Oil & Refining Company and your neighborhood Enco dealer." I seem to recall that Enco was a broadcast sponsor for SWC football games; those of you with intact minds and memories should feel free to correct me if I'm mistaken. So, enough of the chitchat. Here's what you've been waiting for. Here's an 8-second snippet of each university's fight song, brought to you in lovely Fire Ant Lo-Fi. If you can't pick out your alma mater's song, it's probably because your pretentious band director went for a fancy-schmancy cymbals-and-flourish intro longer than eight seconds. Well, prospero año nuevo, y'all! If you're up and reading this before noon on the first day of 2019, you need to improve your social life. Just kidding; your social life is exactly what it needs to be, especially if it includes reading the Gazette. 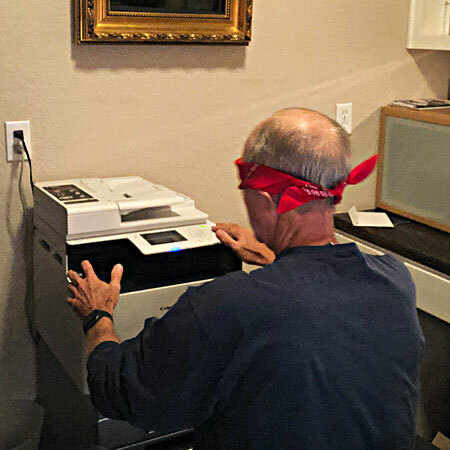 Anyway, my cool cousin Pat, whose typewriter ribbon I'm not fit to change, has challenged me via Facebook to post something on New Year's Day. I think it's highly unfair of her to expect me to actually live up to my stated intention of blogging more regularly in 2019. After all, I said that literally days ago. So, Pat...this one's for you. Be careful what you wish for. How about those crazy squirrels, huh? 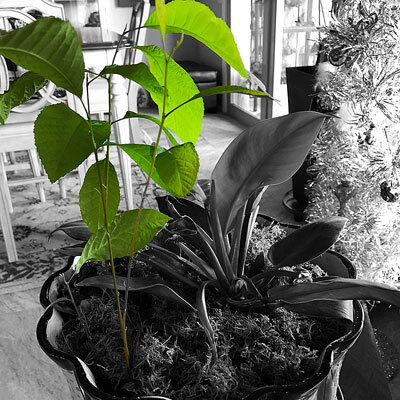 We have a bunch of plants in pots on our back patio, and we're constantly sweeping up after the squirrels who tirelessly dig in them, either burying some treasure, or digging it up, or simply amusing themselves as they sit in the trees watching us sweep. Eh, that's life around a bunch of trees, which is a new experience for us former desert-dwellers. So, we brought a few of those potted plants into the house when the weather turned cold, to protect the contents from freezing. We were surprised a couple of weeks later to see some unusual new occupants sprouting in one of the pots. Our first impulse was to pull them up; the other occupant of the pot might not be happy sharing its little condo with strangers. But I got to thinking: what is a pecan tree after all but nature's way of making pecan pie? Taking the long view of things, my plan is to transplant these pecan kidlings on the bank of the creek that runs behind our house, once the weather warms up, and then let things take their course. If my plan works -- and, really, it's as flawless as all my other ones -- I'll be enjoying a tasty pecan pie on New Year's Day 2025. Well, assuming the squirrels don't get to the pie seeds first.